Today is one of those days that makes me wonder–what happened to the fun in blogging??? When I started Balancing Active, not so long ago, I worked on it every possible waking minute. And that’s when I had another 50-hour-per-week job to manage! I sketched my site design repeatedly from the backseat on a long road trip to Virginia. I hassled a designer to find just the right shade of blue for my “logo”. 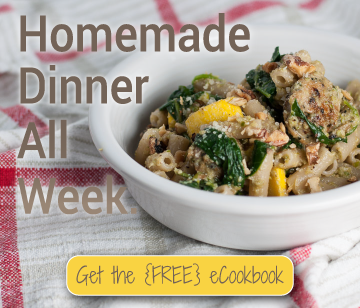 I logged hours upon hours assembling shopping lists and recipes for weekly dinner plans that not all that many people even viewed. But it didn’t bother me. It didn’t stress me out. It was my creative outlet. Now, some days, it’s a battle just to get down to business and focus on an “easy” post like this one. I find every conceivable diversion before plugging in my camera and syncing the photos I took. The towels need washing. Steve’s car needs an emissions test. I have to load the dishwasher. I’m hungry (common problem when my job revolves 100% around food). You know how it goes. At some point, things shifted. Instead of looking forward to new posts from my favorite bloggers, I felt this unwelcome pang of jealousy and competition every time so-and-so posted a new recipe, for the fourth time that week. In a matter of seconds, I dismissed their post as inferior for so many reasons. Their photography is declining. They call that a recipe? Ugh, more chicken. I bet they wrote that recipe just to be Pinterest friendly. And they think they’re a “foodie”. Real foodies don’t refer to themselves as foodies. They didn’t get as many comments as usual. Do they think they’re the first person to ever use goat cheese??? When did food blogging become a competitive sport?! Editorial calendars. Ads. No ads. eBooks (mine, ahem, is free). Lighting. SEO. Pinterest. Snapchat (just NO). Cameras. Is this getting way too serious for anyone else? Because I think today would be a good day to officially put the fun back into food blogging. The only way I can think of to do that? Take away the pressure, real or imagined. I’ve been trying to just chill the last few days with Google Analytics, Instagram, and other addictive apps for bloggers. The fun in cooking and photography hasn’t dwindled one bit, so I’ve been in the kitchen and the “studio”, without rushing myself to post the content I’m accumulating. I worked on the pages for my personal chef service, so I can help busy locals eat more homemade, healthy food. I carefully planned my own dinners for the week, relishing time to flip through cookbooks, magazines, and my Pinterest boards to see what new thing I can cook this week (a ratatouille tart!). I snapped and edited these gratin pics without thinking too much about Pinterest or foodgawker. I went shopping, lounged at about as European of a café as you can find in Connecticut over much too large a croissant, drank a bottle of “Easter” champagne with Steve, started a new book, made muffins with my new favorite sous chef, ran without GPS, and put two yoga dates on my calendar for this week. TWO! Crazy talk, I know. My point is, after all this living of real life, the blog is still here. It’s still my outlet, and it won’t make me happy unless I stay true to my reasons for starting it. I distinctly recall that my goal was never to just throw words out into the universe. As with most bloggers, I want to connect. Mostly, I want to utilize the gift of free time I’ve been given to share anything and everything homemade-food-related that might be just the answer you’re looking for, in the form of a recipe, meal plan, or recommendations for pots in bright colors. Or, in the form of this mushroom potato gratin which I’ve mentioned approximately zero times thus far in its namesake post. 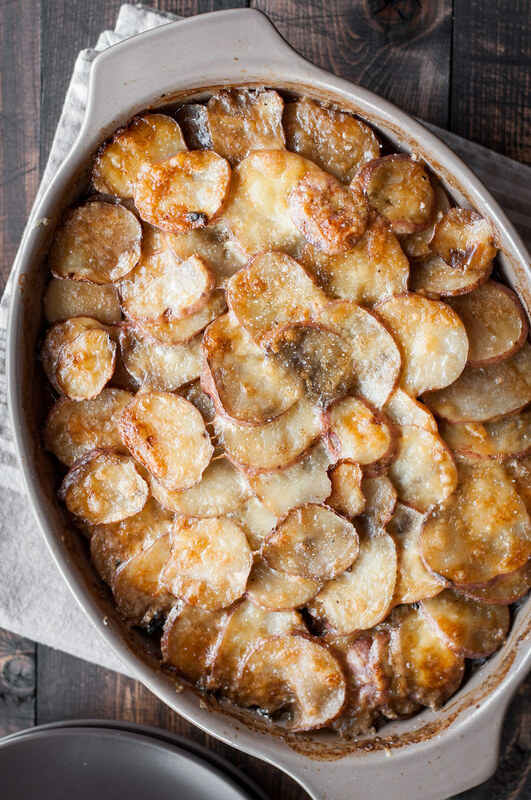 This is a hearty, dare I say, meaty, potato gratin. The hungry vegetarian’s dream. It’s far from the most time-consuming gratin I’ve made, but also not the most simple, if you’re looking for an honest assessment. It is, however, worth whatever amount of time it requires of you. Here’s the breakdown: a layer of sliced raw button and buttery rehydrated porcini mushrooms, nestled between sliced baby red potatoes and submerged in what could basically be described as homemade cream of mushroom soup. As it bakes for an excruciating 1 1/2 long hours, the smell of a single clove of garlic reaches every room of the house, beckoning you to the kitchen. It sounds a bit exaggerated, but I kid you not. 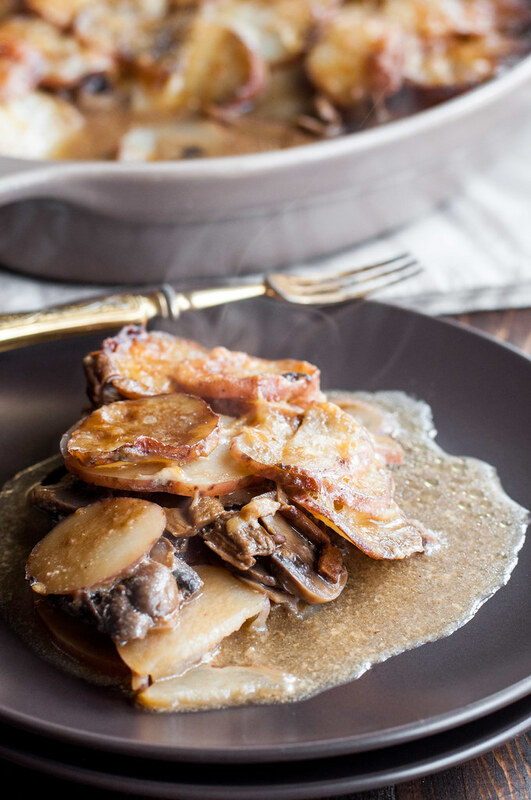 There is a time and a place for cheese-smothered scalloped potatoes (namely–yesterday), but I think you’ll find, as I did, the rich flavors of this variation far more intriguing most of the time. Pair it with a glass of your favorite red wine and light a candle, and I can just short of guarantee it. Adapted from Deborah Madison's The New Vegetarian Cooking for Everyone. Discard all your previous notions of potato gratin, and prepare for rich, earthy flavors that practically beg for a glass of your favorite red wine. 1½ lbs. baby red potatoes, sliced just thicker than ⅛"
In a small mixing bowl, cover dried mushrooms with 1¼ cups warm water. Place a serving bowl or plate over the mushrooms to keep submerged and soak at least 20 minutes, or until needed. If making bechamel, gradually heat milk in a small saucepan with bay leaf, garlic, and onion until just boiling. Turn off heat. Melt butter over medium in a 1 to 2 quart saucepan, then sprinkle in flour and stir constantly with a wooden spoon for a few minutes. The mixture should bubble but not stick to the pan or turn golden--adjust heat as needed. Over medium low, whisk constantly while pouring warm milk mixture into the roux (the flour and butter). Increase heat while stirring or whisking so sauce just bubbles. Cook until thickened, stirring constantly, about 10 minutes. Pass through a fine mesh strainer, then stir in ¼ cup cream or milk. Season with nutmeg, plus salt and pepper to taste. Swish (technical term) the dried mushrooms around in the bowl with your hands, then set a fine mesh strainer lined with a damp paper towel or coffee filter over a liquid measuring cup. Strain mushroom liquid into the cup, pressing out excess liquid from mushrooms gently with back of a spoon. Return bechamel or add cream to a medium saucepan. Over low heat, whisk in 1 cup of the mushroom soaking liquid. Turn off heat and set aside. Chop rehydrated mushrooms into ¼ to ½" pieces. Melt 2 tablespoons butter in a small skillet or saucepan over medium heat. Add chopped mushrooms and sautee about 3 minutes. Add minced garlic and cook another minute, then remove from heat and season with a little salt and pepper. Rub a 2 quart gratin or baking dish with the cut sides of halved garlic clove, then grease with remaining butter. Make a flat layer of half the sliced potatoes, seasoning with salt and pepper. Cover with a flat layer of all the sliced mushrooms, then the sauteed mushroom and garlic mixture. Cover with remaining sliced potatoes, sprinkling with more salt and pepper. Pour reserved mushroom cream evenly over the gratin. Bake gratin for an hour on middle rack. 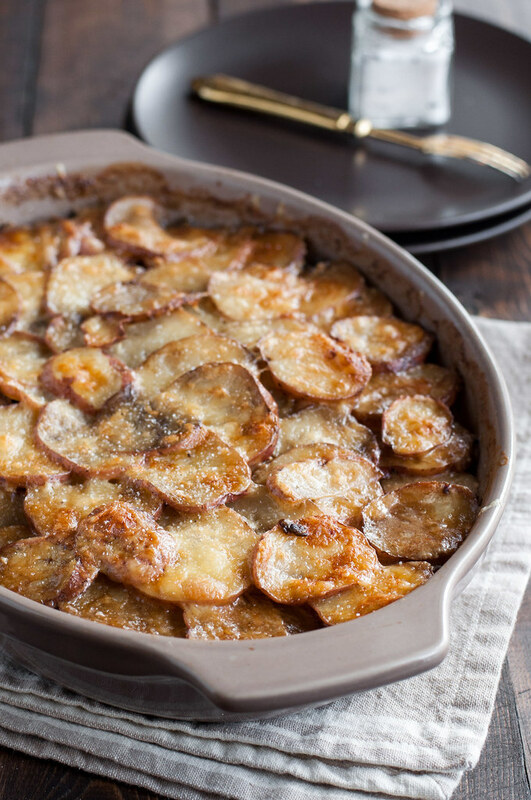 Sprinkle with cheddar, if using, and bake for another 30 minutes, until gratin is bubbling and potatoes are tender. You should be able to see some liquid, as it won't all have been absorbed by the potatoes. Cool slightly before serving. I topped servings with truffle salt that I bought for the potato and celery root gratin. As expected, it was divine. Assemble the gratin up to 12 hours ahead of time. The potatoes will soften slightly, which is fine. Baking time should be approximately the same. 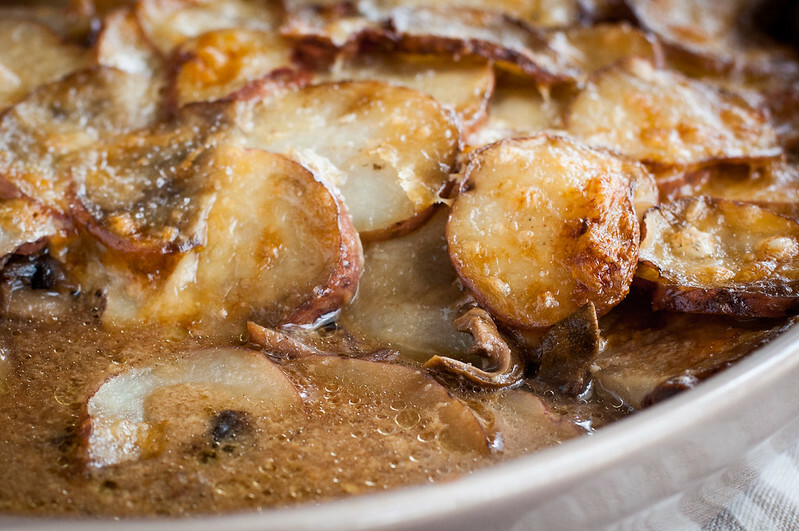 If possible, let gratin rest at room temperature for up to an hour before baking. The dried mushrooms I linked to on Amazon are reasonably priced, but you can probably find them for a little less at the grocery store, at least on a per ounce basis. Feel free to try other varieties of dried mushrooms. Note: This page contains affiliate links. It does NOT contain sponsored content. Affiliate links (to products I recommend, on Amazon) offset my ingredient and website maintenance costs, so I can keep bringing you grown-up recipes like this one. Thanks! This is the epitome of comfort food.. 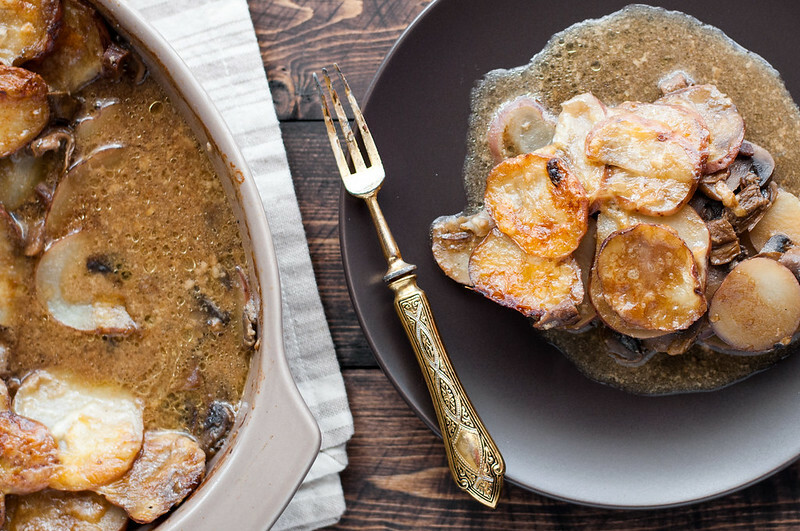 I definitely wish I had a bowl of your mushroom & potato gratin right now – the cold weather is calling for it! Hope it was delicious! Feel free to tag naturalcomfortkitchen on Insta if you take a pic…would love to see it!